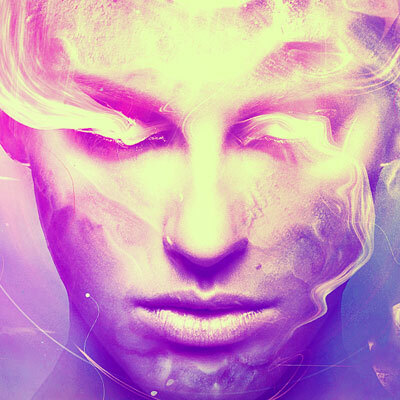 In this tutorial I'll show you how to create a fantasy, sci-fi portrait. You'll learn how to blend a model portrait with a space background, make some special effects using light and nebula textures, manage blending modes, enhance color, paint light, and more. The background color should be #010e27. Go to Layer > New Adjustment Layer > Curves and reduce the lightness. Select the layer mask and activate the Brush Tool (B). Use a soft round brush with black color (soft black brush) to paint on both sides of the canvas. It's to avoid both sides becoming black and to show the details there later. Click the second icon at the bottom of the Layers panel to add a mask to this layer. Use a soft black brush to clear some areas around the middle and both sides. Create a Curves adjustment layer and set it as Clipping Mask. Decrease the lightness to make the effect appear more subtle. Isolate the model using the Polygonal Lasso Tool (L) and add her to the middle of the canvas using the Move Tool (V). Use a layer mask and a soft black brush to erase the neck, shoulders, hair, and forehead. Create a Curves adjustment layer to lower the lightness of the lower edge of the chin and the cheek. Use a soft black brush to paint on the other areas so they won't be affected by this adjustment layer. Use the Lasso Tool to select the mouth only, and then go to Layer > New Adjustment Layer > Curves. Increase the lightness to make this area brighter. Open the ring light image and add it to the main document using the Move Tool. Change this layer mode to Screen 100%. Select Filter > Liquify and activate the Twirl Clockwise Tool (C). Tweak the ring until it gets a similar result to the one shown below, or at least until it has the eye-like part shown in the small screenshot. Use it to cover the left eye. Use a layer mask to erase the areas around this eye-like part. Duplicate this layer and flip it horizontally (Edit > Transform > Flip Horizontal). Move it to the other eye. Drag the nebula 1 image on top of the head and change its mode to Screen 100%. Use the Free Transform Tool (Control-T) with the Warp mode to tweak the form of the nebula to fit the perspective of the head and eyes. Use a layer mask to remove the hard edges. Duplicate this layer several times and move them around the head and face, especially trying to leave some visible effect on the cheeks. Use a layer mask if needed to clear any unneccessary details and get your desired look. Use a Levels adjustment layer to hide all the remaining edges and make the effect more subtle. Place the nebula 2 image in the lower part of the canvas and use Control-T to rotate it as shown below. Change the layer mode to Screen 100%. Create a Levels adjustment layer to remove the edges and make a subtle effect. Drag the fantasy light image onto the top of the head and alter the mode to Screen 100%. Duplicate this layer twice and move them onto the face and to the right. Use a layer mask to erase any details you don't want to see. Use the Lasso Tool to select a left area from the fantasy light image and add it to the lower left of the model. Turn it into a curve using the Forward Warp Tool. Erase the hard edge of this result using a layer mask. Select another part from the light image and do the same technique. Add it to the other side of the model. Add more small details using a similar method. Create a new layer and use the Elliptical Marquee Tool (M) to grab a circle and then activate the Gradient Tool (G). Use Radial Gradient with the colors #f8b2f2 and #834115 to fill this circle. Tweak this circle using the Forward Warp Tool and place it along the contour of the model's face. Change this layer mode to Color Dodge 100% and use a layer mask to make the effect appear subtle along the lower part of the cheek. Duplicate this layer twice. Move one to a higher position on the cheek, and flip the other horizontally and then place it on the other cheek. Use a soft brush with the color #81a3ef to paint on the top of the head, cheek, and chin. Alter this layer mode to Overlay 100%. On a new layer, use a soft brush with the color #8c8dcb to paint on the lower section of the canvas. Set this layer mode to Hard Light 30%. Change the brush color to #a797c1 and paint on the top left of the model. Keep this layer mode at Hard Light 30%. Create a Gradient Map adjustment layer on top of the layers and pick the colors #912d1d and #004460. Lower the Opacity of this layer to 20%. Use a Photo Filter adjustment layer and pick the color #ecde00. Make a Curves adjustment layer to add a warm tone and increase the contrast of the image. Create another Photo Filter adjustment layer and change the color to #dab9f4.